US GDP: Is 4% Growth Achievable? The Wall Street Journal and The Financial Times say no. There is not a reason in the world why we cannot grow at a rate of 4% a year. And that will be my goal as president—4% growth, and the 19 million new jobs that come with it. So in the 1980s and 1990s, there were 10 years of 4%+ growth. But those decades benefited from a unique convergence of strong demographics and a technology boom. Looking forward, we still have the technology boom but demographics have turned from tailwinds to headwinds. We used to have a falling dependency ratio and a faster growing population. 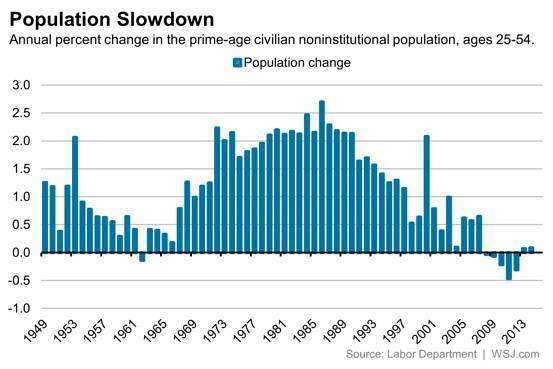 But we will now have for some time a rising dependency ratio and a slow-growing population. Note in passing that Jeb Bush sees his economy growing at nearly double the rate of his father’s (2.2% average growth) and brother’s (2.1%). This column in the Wall Street Journal does an excellent job of subjecting Bush’s “4% and 19 million” targets to the demographic math. The author Josh Zumbrun casts doubt on the plan’s feasibility by showing that the segment of the US population aged 25-54 has stopped growing in the early 2000s (chart). In the three decades to 1997, this segment had grown every year in excess of 1%. In the 1980s, it had grown over 2% per year. Getting to 19 million jobs would require some combination of three things–first, dramatically reversing the decline of prime-age participation, or, second, boosting the employment levels of teenagers and seniors (the latter of which is already climbing, although that partially reflects the economic insecurity of people who would prefer to be retirees). Absent that, the third way to boost the size of the U.S. population and its workforce is with significantly more immigrants. In order to add 19 million people, you’d probably need all three things–lots more teen jobs, lots more participation of prime-age workers and lots more immigrants. 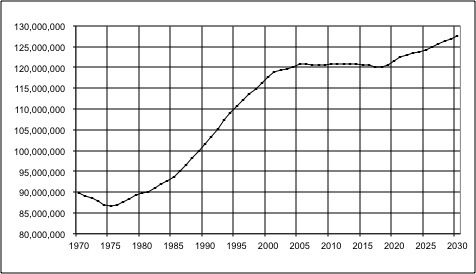 In a similar vein, I had previously looked at the 30-60 age segment and found that it grew steadily from 1976 to 2005 but that it stopped growing in 2005, and that it will remain flat at just over 120 million people until 2020 when it will start growing again. This 15-year flattening of the most economically active age segment explains the slackening in demand seen in many sectors. The Federal Reserve and Congressional Budget Office both peg the economy’s long-run potential growth at around 2% to 2.3%. Without different demographics, a massive influx of immigrants, or a technological miracle, an entire decade of 4% GDP growth–just mathematically–is a very high goal. The Financial Times weighed in a couple of days later with an editorial headlined Jeb Bush’s fantasyland of 4 per cent growth. Like the Journal, the FT explains its skepticism via low US productivity and poor labor force demographics. It offers a wide range of remedies to alleviate the former through better worker training and infrastructure investments, and the latter through statutory parental leave, more immigration and a higher retirement age. Even so, the paper deems that 4% is likely to remain elusive. Mr. Bush may be dangling an unrealistic target. But his gimmick will serve a purpose if it concentrates minds on how the US can realistically improve its game.